When you live in New York City, you rarely see wetlands, even though the entire city sits within an enormous estuary. Much of the metropolis’s natural waterfront landscape has been filled-in or paved over; most residents only glimpse salty fields of billowing reeds from the window of the AirTrain shuttle or New Jersey commuter trains. But a new 5.5-acre expansion of Hunter’s Point South Waterfront Park, located in Queens where Newtown Creek meets the East River, puts New Yorkers right next to a restored wetlands habitat. What’s more, the park will serve as a buffer against future storm surges. The project, which officially opens today, is a capstone to the transformation of an almost-mile-long stretch of Queens waterfront that offers views of the Franklin D. Roosevelt Four Freedoms Park, the United Nations Headquarters, and the Manhattan skyline. A series of previous parks (Gantry Plaza State Park, opened 1998, and Hunter’s Point South Waterfront Park Phase 1, opened 2013) have slowly reclaimed the site’s formerly-industrial landscape, which included massive gantry cranes that loaded freight rail cars onto barges that plied the East and Hudson Rivers. Both previous parks preserved elements of this industrial landscape, such as the gantry cranes, even as high-end residential towers arose next-door. 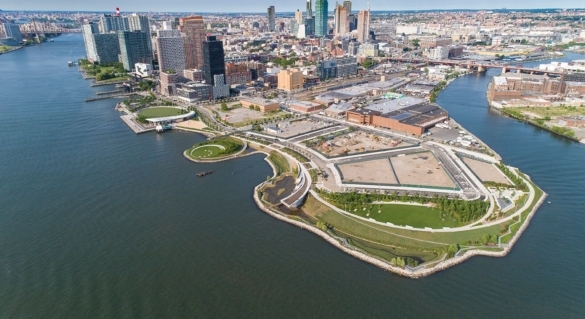 The first phase of the Hunter’s Point South Waterfront Park (designed by SWA/BALSLEY, which was then Thomas Balsley Associates, and WEISS/MANFREDI) also featured resilient design: its landscape includes bioswales and a 285-foot-by-210-foot green oval of synthetic grass. Both features absorb floodwaters and were put to the test by Hurricane Sandy in 2012; the park successfully absorbed and slowly released the deluge. “In a way, it became kind of a poster child for how parks should operate at the water’s edge,” says Michael Manfredi, cofounder of WEISS/MANFREDI. While the park’s first phase featured a wide variety of more “active” uses—a playground, two basketball half-courts, two dog-runs, a cafe, the green oval, and a sand pit with a volleyball net—the second phase is designed for more passive uses, such as picnicking, strolling, and lounging. The years between the first and second phase did enable the architects to tweak the design by including more paths for running as well as a boat launch for a local boating community. The second phase also includes a set of outdoor exercise equipment, but overall, its landscape is tranquil and isolated. This is especially true on the park’s circular peninsula, which that features a subtle site-specific installation by New York artist Nobuho Nagasawa that’s inspired by the phases of the moon. Both firms had always hoped to create an intimate island (seen here) located where an enormous mound of dirt once stood. The city initially ruled against the idea, though later realized the parks needed more wetlands, a move that would necessitate an island-like design in this section. “[The island] had been a dream, and we were thrilled that there was, effectively, an engineering and horticultural criteria that said we must make it an island,” says Weiss.